Personal Assistance Issaquah Washington Gimmie a List home services Issaquah and is your Dream come true for someone that needs cloning or duplicating. Whether you need a wife in Issaquah, A mother in Issaquah, or just call us a partner. Ladies if you’re a busy mother in Issaquah, well we are there to save you busy Lady. RELAX!!! If you’re a professional and a mother in Issaquah and working right along with your husband OR it’s just you. You’re working so hard in Issaquah to do everything for everyone else with rarely a moment for yourself. GENTLEMEN Do you wish you had time to do what you would really like to do in Issaquah? Not waste time on tedious things. Housekeeping, laundry dry cleaning, tasks? Or getting groceries? 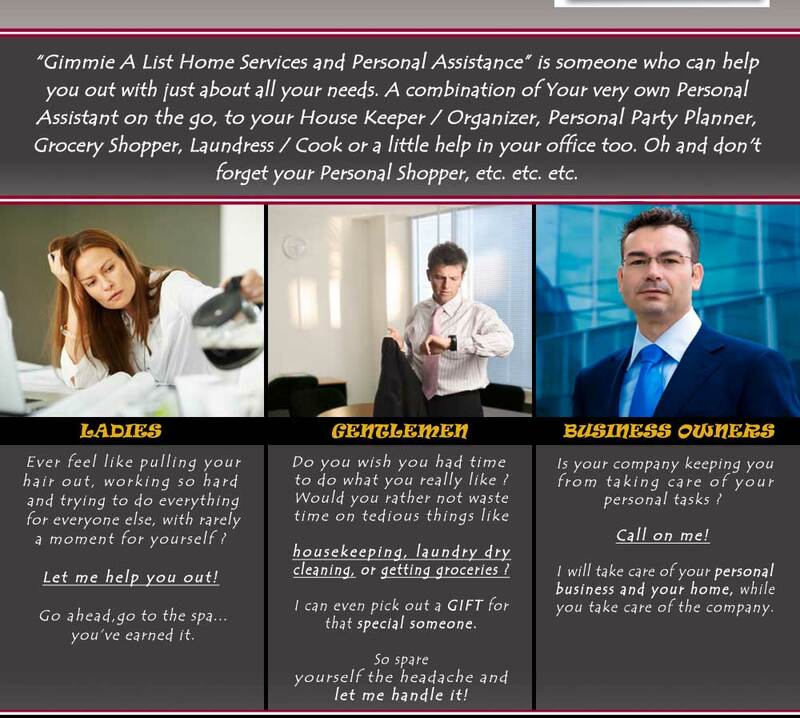 BUSINESS OWNERS in Issaquah is your company keeping you from taking care of your Personal tasks? We are there to help you all whether it is in your home or running around doing all the errands and outside things too. You can do what you would rather be doing with your time. What you would get is your very own Personal Assistant in Issaquah that would help you from making your phone calls and arranging things that need to get done around your home in Issaquah. If you need to get your house repairs in Issaquah we’ll help you find the right person. Get your bids, do the corresponding, and meetings if need. If you need to plan a trip for the special vacation in Issaquah. Let us handle it. Or you might need to get the office set up nicer, neater. Maybe you need to go get that gift in Issaquah for that special someone in your life. Got it !! Done…. Or maybe you need some help with a occasion, Birthday, Wedding, Anniversary in Issaquah, You name it. 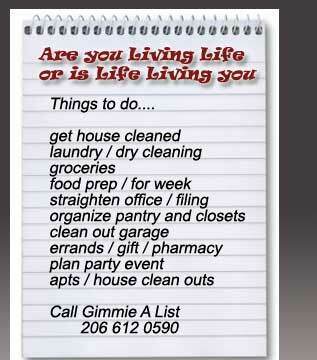 Someone that can help you in Issaquah do all the things that you would be doing if you weren’t so busy. If you need a housekeeper in Issaquah? You’re calling the right people. We are very detailed orientated. You won’t have to get ready for us. Just leave it. Do you ever get tired of trying to figure out what to make for dinner in Issaquah so you find yourself reaching for all the wrong foods? You wish you had someone to help you plan a weekly menu in Issaquah or do the shopping for you in Issaquah. Well we do it whether it be waiting for home delivery or doing the actual physical shopping. Preston, WA is 4.94 miles from Issaquah WA. Newcastle, WA is 5.78 miles from Issaquah WA. Eastgate, WA is 6.40 miles from Issaquah WA. Newport Hills, WA is 6.76 miles from Issaquah WA. Lake Alice, WA is 7.11 miles from Issaquah WA. Cascade, WA is 7.16 miles from Issaquah WA. Fall City, WA is 7.20 miles from Issaquah WA. Highlands, WA is 7.22 miles from Issaquah WA. Maplewood, WA is 7.44 miles from Issaquah WA. Hazelwood, WA is 7.56 miles from Issaquah WA. Hobart, WA is 8.00 miles from Issaquah WA. Sammamish, WA is 8.06 miles from Issaquah WA. Ames Lake, WA is 8.11 miles from Issaquah WA. Kennydale, WA is 8.17 miles from Issaquah WA. Palmer, WA is 8.18 miles from Issaquah WA. Kanaskat, WA is 8.18 miles from Issaquah WA. Spring Glen, WA is 8.28 miles from Issaquah WA. Beaux Arts, WA is 8.48 miles from Issaquah WA. Maple Valley, WA is 8.55 miles from Issaquah WA. Renton, WA is 9.23 miles from Issaquah WA. Mercer Island, WA is 9.28 miles from Issaquah WA. Lake Joy, WA is 9.34 miles from Issaquah WA. Bryn Mawr, WA is 9.53 miles from Issaquah WA. Bellevue, WA is 9.62 miles from Issaquah WA. Snoqualmie, WA is 9.68 miles from Issaquah WA. Carnation, WA is 9.86 miles from Issaquah WA. Personal assistant Issaquah wants to remind you that Easter and spring is coming and we want to help you clean your home in Issaquah. We are the best at doing personal assistance work for all of your needs. Personal assistant Issaquah understands what a cleaned and picked up home means to you before the family and friends come over for the Easter Holiday. Having friends and family over Personal assistant Issaquah will help you with all of your cleaning and other household duties. Personal assistant Issaquah will help you shop and cook that perfect meal when you do not have time if you live in Issaquah. Call Personal assistant Issaquah and we will help you today.